Enterprise Resource Planning (ERP) plays an important role in the manufacturing industry today, as it streamlines operations, accelerates inventory and warehouse management, addresses customization requirements, and provides companies with the competitive advantage. Manufacturing firms and ERP systems has had a long correlation focused at managing complicated supply-chain process to build profitable, sustainable businesses. 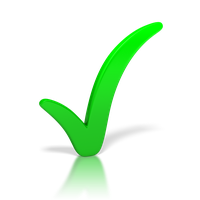 While selecting the most suitable EPR software for their shop floor, many manufacturers today look at ‘software functionality’ as a core aspect. From stand-alone manufacturing software packages to tightly integrated solutions, the ERP systems in the manufacturing arena are set to address the increasing requirements. The improvised versions of ERP solutions mainly revolve around cloud computing, mobile solutions, and real-time business intelligence, along with advancements in warehouse automation. Further, recent developments in ERP softwares integrate multiple business functions like inventory, production, sales and finance into a single unified database, called ‘information hub’. This data delivery platform proffers accurate and real-time information critical for the manufacturing industry. It facilitates robust demand planning and production control, integrated financial management, and a strong inventory control for both raw materials and finished goods inventories, which was once a dream for the manufacturers. 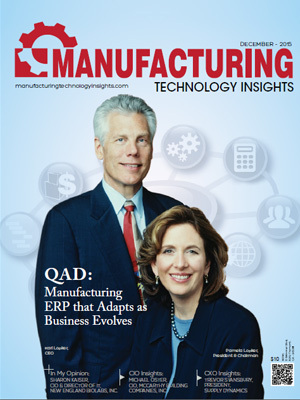 In an effort to help the technology savvy manufacturing business leaders and CIOs find the right technology solution provider for their enterprises, a team of prominent CEOs, CIOs, VCs, analysts, along with the Manufacturing Technology Insights’ editorial board has evaluated scores of ERP solution providers in the manufacturing sector and picked out a list of prime choices. 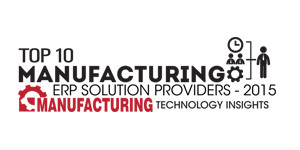 We present to you Manufacturing Technology Insights’ Top 10 Manufacturing ERP Solution Providers 2015.
iqms A company that offers an end-to-end, manufacturing ERP software solution designed to support shop floor automation, reduce labor requirements and increase capacity.